Factorization is a Mod that aims to add machines to process ore and craft materials. As of version 0.7.15, an energy system called 'charge' has been added to power most of the machines in this Mod. 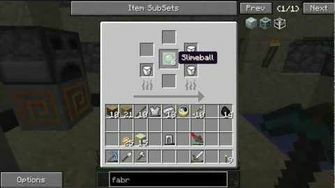 Utility items such as the Pocket Crafting Table and Barrels that can store 64 stacks of a single item type. An ore processing system which ultimately allows to triple Ore output, coupled with the Packager, a handy way of compressing blocks for storage. A crafting system that is more complicated than the Autocrafting Tables but can ultimately be more flexible. The Wrath system allows access to machines such as the Router (evenly distributes items between inventories), Upgrades such as the Extra-dimensional Storage Upgrade (allows storage of up to 1024 stacks in a barrel) and the Wrathlamp (allows to light up a much larger area than a normal light source). Finaly Send the Crystallized Metals back to the Slag Furnace (see note) to receive the Metal Ingots. Each step gives an average of 40% boost in metal output. Going through with the whole process results with approximately a 300% increase in production . For Players with Thaumcraft an Infernal Furnace may be used to increase yields in the form of extra Nuggets. This page was last modified on 22 April 2019, at 18:54.